The Vicious Triangle - Eddie Joseph - reprinted from "Coin & Money Magic"
News and Notes - Busby Corin, Inc. The Close-Up Magic of Danny Tong - Magic Art Book Co.
Marcom Presents Magic - Magic, Inc. In Defense of Gospel Magic - Robert J. Zoerman, Jr. Walking Thru A Keyhole - Ormond McGill - reprinted from "21 Gems"
Sleeving ... How to Do it ... What to Do with it - Magic, Inc. Considering How to Modernize Your Act or ... Are You Out of Date? impromptu lit cigarette thru handkerchief and then rises - reprinted from "Cigarette Tricks & Gags"
The Children's Nightmare - Bill Nagler, M.D. Charlie Miller on the Card Index - Magic, Inc.
Getting Tips - Fees, Tips, Etc. A Matchless Packet - reprinted from "Between Cocktails"
The New Pentagram, Nov. to Feb. 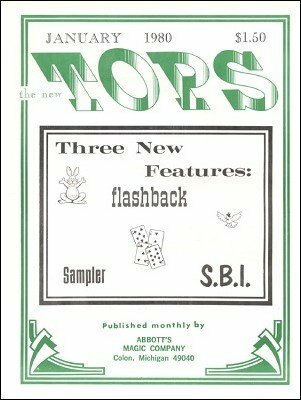 Shot in the Dark - Master Magic Co.
Cigarette from Nowhere - William S. Houghton - reprinted from "The Magic 36"
Larry Jennings Card in Envelope Wallet - Busby- Corin, Inc. There's No Free Lunch But There are Still Free Shows! Cut and Restored Rope - Loring Campbell - reprinted from "This is Magic"
Very Special Notice - re: Transition to "Lost in the Forest" containing "Trying Times Magic"
a thimble effect - Duke Stern - reprinted from "Latest Thimble Magic"
Important Note - re: Transition in November to "Lost in the Forest"
The Great Automobile Surprise or, Mystery of the Abbott-Detroit "30"
Self-Service - Ravelle & Andree - reprinted from "Magic Ala Carte"
Announcement - re: Transition in November to "Lost in the Forest"
Point - Eddie Clever - reprinted from "Thought Wings Onward"
15 illusion plans - Paul Osborne and Associates, Inc. Answers to "A Magical I.Q. Test"
Lo Vision Playing Cards - Cidco Co.
A Coin Transposition - Tom Sellers - reprinted from "Twenty by Tom Sellers"
The Knot of Foam - Tenkai - reprinted from "Encyclopedia of Rope Tricks, Volume Three"